Choice, Consequence and Thematic Coherence in Chris Avellone’s games. “Reactivity”. “Choice and consequences”. “Influence”. These are the watchwords for the RPGs designed by Chris Avellone. For example, one of the major features of Alpha Protocol (2010) was the branching path structure of its story, depending on what the player chose to do. The world of Alpha Protocol reacted to the player’s choices, making it feel like they were really changing the story as they played. More than just being a quirk of game mechanic design, this philosophy permeates the Avellone-led Black Isle/Obsidian RPGs in surprising ways. It goes beyond just being a player ego-stroking mechanism into every aspect of the games. Planescape: Torment‘s protagonist can influence the story, setting and other characters in countless ways, and while this in itself makes for an interesting game, the mechanic complements the theme of the story: that belief can influence reality itself. Musings on self-fulfilling prophecies and consensus reality are integrated with the structure of the game. If video games are power fantasies, designed to make players feel like they can impact the world, then these RPGs are both archetypal examples and subtly subversive at the same time. While they allow the player to make all manner of changes to the game world, they also ask the player to reflect on the consequences of their actions. To see how this approach differs from other RPGs, consider the popular but controversial Mass Effect 3, the original endings of which prompted criticism that none of the player’s choices really mattered. Defenders of the game replied that this was the story BioWare had wanted to tell, and so it should be accepted by the players as such. It is a delicate balance, but in a medium defined by user input, the experience is most satisfying if the need to tell a story is balanced with giving the player choice in how it unfolds–if the story is the player’s story, and the player is not simply a bystander. In many games, the player is to the game’s plot as Indiana Jones is to Raiders of the Lost Ark. They are at best just there to perform the requisite tasks to fulfill the writer’s story. Not so with Planescape/KotOR II/Alpha Protocol–in these, the player is the story. Kreia is seemingly amoral, allied with neither the Jedi nor the Sith, but uses both to achieve her goals. To gain influence with her, the Jedi Exile (the player’s character) must show that they can make logical choices consistent with furthering their own long-term goals–in other words, that they understand choice and consequence. Kreia doesn’t care if you are good or evil–just so long as you know what you are doing and can strategize to make it happen. In this way, the game mechanics, characters and story are all fully integrated. The mechanics reinforce the characters who reinforce the theme. This level of coherence is what produces a truly satisfying experience. When game mechanics clash with the theme or the story, the player feels subconsciously confused. Since games, unlike other art forms, rely on user input to tell the story, it only makes sense to center them around the user’s input in every respect. If thematic coherence is what makes Art great, the greatest games should surely be built around the idea of player choice. This time of year is always important for the video game industry, as they move their products into stores for the coming holiday rush. Games have become one of the most successful forms of popular entertainment, with recent years seeing multi-million dollar launch events that break records once belonging to Hollywood. Early December is the peak time of year for selling the latest installments in hit franchises to loyal fans. 10 years ago today, the sequel to 2003’s Game Of The Year was released. And not only was it a sequel to an award-winning instant classic; it was set in the Star Wars universe; George Lucas’s billion-dollar space-faring fantasy whose allure has captivated generations. Small wonder, with such a pedigree and promise, that LucasArts was eager to ensure it was released in time for the Christmas shoppers–they wanted to be sure to get everything they could out of this highly-anticipated title. This eagerness caused them to encourage Obsidian Entertainment to push the release of the game forward, even if it meant not having time to finish the ending as originally planned. The result was that the game, though eagerly bought up by thousands of fans, did not receive quite the same delighted reviews as its predecessor; that it was criticized as incomplete, or incoherent. Its last few hours in particular were perceived as a rushed muddle of action sequences that arrived at a confusing and unsatisfying conclusion. And so with this moderate, but not spectacular, success behind it, the “Old Republic” franchise moved on; to be resurrected again, briefly, first as a book and then as an MMORPG to go to war against World of Warcraft–a war which, like the Mandalorian Wars that form the background of KotOR II, is a futile and depressing effort from which no combatant ever returns victorious. Obsidian Entertainment has moved on as well, most notably to the retro-futuristic Mojave wasteland of Fallout: New Vegas. Both developer and franchise have gone their separate ways; and though talk of another Obsidian-made Star Wars game surfaces now and again, it seems likely that, given Disney’s purchase of the galaxy far, far away, the darker and more mature tones Obsidian always brings to their stories may not be as welcome. So what to make of Knights of the Old Republic II, ten years later? Now that the Star Wars film series has been ended and revived yet again, now that Mass Effect, BioWare’s spiritual successor to KotOR I, has run its course, and left its original fans as bitter as Star Wars fans dismayed at the prequel trilogy; where does that leave Obsidian’s strangely rough, brooding tale of the exiled Jedi who travels the galaxy not to defeat an Empire or rescue a princess, but to come to terms with the effects of war on the human psyche? Kreia is always the focal point for any discussion of Knights of the Old Republic II, and even the game’s detractors will usually admit that she is one of the greatest characters in the history of video games. A mysterious old woman, allied neither with the Jedi nor the Sith, yet overwhelmingly knowledgeable about both, she at once fits the Star Wars tradition of the Wise Mentor and violates it utterly. She is a gadfly in the Star Wars universe, questioning everyone and everything; and by the end, the player comes to understand that her rebellion is against the Force itself; the mysterious metaphysical “energy field” which most characters accept with a (sometimes literal) hand-wave, but which she attempts to understand and destroy. Many players find it immensely satisfying to see this brown-cloaked Nietzsche slicing through the pop-philosophy of Lucas’s universe. Kreia’s occasionally harsh criticism of the player’s actions are emblematic of one of KotOR II‘s distinctive features: namely, that it is not necessarily meant to make the player feel good. In literature, film and television, it is common for a story to leave the audience sad, or contemplative, or shocked. But games are meant to entertain; and to write one that does not simply laud the player for their victories over ever more powerful foes, but instead compels them to think about what they are doing–to think of, as Zez Kai-Ell says in the game’s pivotal scene, “all the death you caused to get here”–was a bold move, indeed. In this way, KotOR II is the forerunner of another one of the most fascinating games released in recent years–2012’s Spec Ops: The Line. Though different in style and in tone, (not to mention that SO:TL is far more polished and graphically advanced) Yager’s dark satire of military shoot-’em-ups is at its core the same tale as KotOR II: that of a soldier who commits an atrocity and is forced to face the consequences. 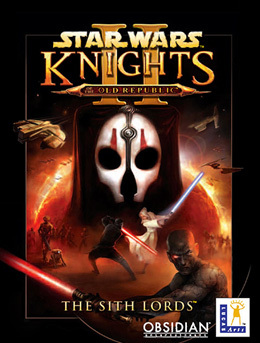 But while Spec Ops is a sharp, tightly-plotted tale with every element integrated into its gripping narrative, KotOR II is less minutely-engineered, and more filled with oddities and curious plot threads which lead in unexpected directions–or sometimes nowhere at all, thanks to the content having been cut at the eleventh hour. While this makes the game seem less focused and at times even hard to follow, it also lends it a certain feeling of scope; an epic, vast implied scale that even next-generation open-world RPGs have not matched. There is a hauntingly depressing quality to the sprawling modules of Citadel station, of gloomy isolation to the corridors of Peragus, and of melancholic splendor to the partially restored surface of Telos, that creates a peculiarly memorable and powerful mood. Of course, it’s impossible to talk about KotOR II‘s plot threads without also discussing The Sith Lords Restoration Project–the fan-made effort to restore the cut content. While interesting in its own right, and a must-play for any fan of the game, the restored content ultimately raises more questions than it answers. Some of it really is integral to the story, but other parts are relevant only as curiosities, and serve only to add unnecessary complications to the game’s already complex plot. But even with the missing pieces restored, insofar as possible, KotOR II remains a very odd, misfit game–an exile, like its enigmatic, war-worn protagonist. If the original KotOR was an effort at making a playable version of the summer swashbuckling blockbuster epic that Star Wars helped revive, then KotOR II was an attempt at making a playable version of a more mature, David Lean-ish kind of epic. It is not designed for commercial success and records, but for critical success and acclaim. It is Oscar Bait in a medium that does not receive Oscars. It is possible that being part of such a widely recognized franchise hurt its chances among the very people most likely to appreciate its many virtues. Critics searching for video games that prove the medium is a mature art form, not merely an entertaining diversion, can be too quick to dismiss a “mainstream” game in search of something more unusual. And few entertainment franchises show a more striking disparity between their commercial success and their reputation among critics than Star Wars. In spite of its less-than-universal acclaim, though, KotOR II has not been completely forgotten by gamers. In 2010, it was included in the book 1001 Video Games You Must Play Before You Die. Kreia still frequently appears on lists like “best video game characters” and “best female antagonists in video games”. But it has not been considered particularly “influential”, either; certainly, it has not become a household name like, for example, Valve’s Half-Life 2, released three weeks earlier. Much of the plot of Knights of the Old Republic II is concerned with finding that which has been lost–be it knowledge, people, or places. As Kreia explains at the end, the real “lost Jedi” the Exile has been searching for have been there all along–“they simply needed a leader and a teacher”. Similarly, the nightmarish planet of Malachor V–the site of the pivotal battle that is at the heart of the game’s entire plot–had been forgotten by the Sith Lords of times past, before being rediscovered in the Mandalorian Wars and spawning the innumerable stories of victory, heroism, defeat, death and horror that the Jedi Exile encounters on the journey across the galaxy. And so it is fitting, as the medium matures and gamers and game critics cast about for evidence to prove its legitimacy as an art form, Star Wars: Knights of the Old Republic II: The Sith Lords sits quietly on the fringes of the game universe like Malachor V; not at the center of attention, perhaps, but still well remembered by all who have seen it firsthand. Why “Knights of the Old Republic II” has one of the best endings ever. Atton alludes to the last Jedi he kills telling him of a place where Force sensitives are sent by Revan to be broken. This is almost certainly Malachor V.
HK-47 says that, as result of the destruction at Malachor, Revan was inspired to build him. So, as he puts it, perhaps the Exile is responsible for his creation. Visas’s homeworld was destroyed by Nihilus, who was created by Malachor, and whose fleet was hauled from it. This act has clearly left deep physical and psychological scars on Visas. Yusanis fathered the handmaiden with the Jedi Arren Kae, and he went with her into the Mandalorian Wars, breaking his vow to his wife. This act shames the Handmaiden. Kae (apparently) died at Malachor; making Yusanis enter politics and eventually get assassinated by Revan. He may have been at Malachor, and was obviously deeply affected by the war, hence Brianna’s interest in the Exile, who is the first person she has known since her father who suffered the effects of the war, and her loyalty to Atris, which is to make up for the shame her father’s infidelity brought upon her. Bao-Dur has feelings of guilt about Malachor that made him come to Telos to aid the recovery. He also lost his arm at Malachor. He still harbors feelings of guilt for creating and using the Mass Shadow Generator. Mical the Disciple was turned to his path of “historian and scientist” by the decision of the Exile to go to war, when he was not chosen as a Padawan. The Mandalorians were badly beaten in the battle, necessitating Canderous Ordo (who was also at Malachor) to take up the mantle of Mandalore and reunite the clans on Dxun. G0-T0 exists for the purpose of rebuilding the galaxy from the war. Atris was clearly very close to the Exile in the past, and was affected deeply by her decision to go to war, as well as the resulting horror of the battle of Malachor. This clearly has deep psychological effects on her, possibly contributing to her fall to the Dark side. In the game’s pivotal scene, when the Exile returns to the Jedi Enclave to meet/fight the remaining Jedi, it is revealed the s/he was also deeply affected by that last battle, and forced to cut his/herself off from the Force to survive. The destruction of Peragus serves as an effective opening, because it reminds the Exile, subconsciously, of the annihilation of Malachor. Furthermore, Atris, Lieutenant Grenn, the Ithorians, Colonel Tobin, GO-TO and others all comment on how the lack of fuel will harm Citadel Station. Thus, Exile must come to grips with the “echo” of the destruction of Peragus. This, the game hints, is the first time the Exile has ever truly had to confront the consequences of his/her actions. Thus, by the time she leaves Telos, the Exile has seen or been told of the consequences of two of the more remarkable acts in her life, and Atris even compares the destruction of Peragus to that of Malachor. The scene in which the Exile chooses either to help or furiously dismiss the beggar on Nar Shaddaa is key. Kreia allows the Exile a glimpse at the consequences of his/her choice, and reveals that it is not always as clear-cut as it may appear. Nar Shaddaa is home to refugees from both wars. Dantooine was badly damaged as a result of the Jedi Civil War, which was itself a result of the Mandalorian Wars. Onderon is relatively unaffected by the actions of the Exile prior to the game (though s/he fought on Dxun) but the Onderonian debate between secession and isolation and remaining in the Republic bears a close resemblance to the Exile’s choice of whether to close his/herself off from the Force or to embrace it. Telos presents the Exile with an opportunity for redemption, in the form of whether to help the war-ravaged planet recover, or not. (Though, as we will see, the way to do that isn’t as black and white as it seems.) More immediately, in the game’s final act, the Exile is called upon to save Telos from Darth Nihilus. This episode is particularly ingenious, as forces from Onderon and Dantooine arrive to help the Exile, who wouldn’t have done so otherwise. Of course the recovery efforts on Telos and the Political Situation on Onderon are also interdependent, as the Ithorians are repopulating Telos with the Onderonian’s and Dxun’s beasts. Korriban presents the Exile with the cave, where s/he must confront the pivotal moments in her past, and reflect on whether s/he would do things differently. The Ubese warriors in Visquis’s lair are bitter about the bombing the Republic wrought against them in the war, and have thus been made into “weapons”, as Visquis says. This foreshadows the creation of the Sith Lord Nihilus and his hordes by the activation of the Mass Shadow Generator, as well as Revan’s ultimate plan. The impact of the destruction and subsequent restoration of Telos is seen in many facets of the game, from the separation of Aiada and Lootra on Nar Shaddaa, to the beast rider whose Boma escapes outside of Iziz, to the oft-repeated need for fuel for Citadel Station by everyone from Lt. Grenn to Atris to Col. Tobin, show the echoes of Saul Karath’s attack. Telos is again threatened towards the end of the game in the battle against Lord Nihilus, and here again, the Exile sees the consequences of his/her decisions (Peragus, Dantooine, Onderon and Malachor) play out. The entire game builds, subtly yet relentlessly, into an awesome thematic experience that shows all the consequences of Malachor, of Peragus, of Telos, of the Mandalorian Wars and ultimately, as Kreia says: “of all wars, of all tragedies that scream across the galaxy.” Again and again, consequences of actions are shown, leading up to the last planet, where the Exile must walk upon the dead planet of Malachor, and culminating in the ending scene, in which Kreia tells the Exile how his/her choices will impact the planets and people s/he has met throughout the journey. This works well, because the player has already seen the consequences of past choices throughout the game. But the true genius is not only that the theme is so brilliantly and so pervasively intertwined with the story, but also that it does not carry any judgment. Things may be called “light” and “dark” by characters, but the player can make their own decision. Is the “independence” of Gen. Vaklu or the “cooperation” of Queen Talia better for Onderon? The pragmatic Czerka Corp. or the more spiritual Ithorians better for Telos? And the central question of the game: was the destruction of Malachor justified? It killed many, and ruined the lives of many more. On the other hand, would not countless more have died if the war had not ended, as the Exile can argue? And anyway, if not for Malachor, Mira, Atton, Bao-Dur, Mandalore, Brianna and Visas would not be around to help the Exile on the journey. And perhaps the most widely asked question: Is Kreia a Jedi or a Sith, good or evil? It must be played through many times, and the player must make many different choices, but the game’s theme remains awesomely consistent no matter how the game is played. People complain about the game’s ending, but frankly, I found it perfectly coherent and satisfying, once I understood all these concepts. It’s actually one of the best endings I’ve ever seen in a video game. Incredible fan-made Lego figures based on video games! I was searching on Knights of the Old Republic II the other day when I stumbled across these awesome custom KotOR II Lego figures made by Justin R. Stebbins, aka Saber-Scorpion. (My personal favorite of his figures is Mandalore) He also has KotOR I creations, as well as custom Lego for a bunch of other great games, including Planescape: Torment, Fallout and Metal Gear Solid. Check it out. As I was looking around at his work, I did start thinking how awesome a full-length movie adaptation of these games with the Lego figures would be, even though I’m not normally a fan of adapting games into movies. Since their lips don’t move, you could use the original voice readings from the game. One of my favorite things about Lego is how easily it lends itself to stop-motion animation. Actually, though, I know there are video game adaptations of various franchises using Lego characters… maybe KotOR III should be done in that style, appealing to two fan-bases at once? And of course, Fallout: Lego Island practically writes itself… no, maybe that wouldn’t be a good idea.